The One About Nested CSS and differences between "Easy" and "Simple"
Rich Hickey gave a really excellent talk in 2011 at Strange Loop about the difference between 'Easy' and 'Simple'. The talk challenges some current best practices in the software industry that optimize for ease-over-simplicity. I'm going to take the gist of the talk and apply it to CSS where the last few years have seen an increased drive toward a similar simplicity but with a different veneer. Hickey draws the distinction between Easy and Simple. He makes it clear that although they may seem similar at first, closer inspection reveals that these terms refer to quite different things. He argues that Easy things are familiar and usually part of (or within reach of) our skillset. Simple things, by definition, are not Complex. They are unentangled. Software writers tend to champion constructs (e.g. tools, languages) that are easy-to-use. These constructs often produce complex artifacts (tangible stuff, e.g. the application that was given life at the end of your build/deploy process). Easy things are within reach of skills that we may have already developed, and they are optimized heavily for early speed, but they ignore complexity. Over time, the growing complexity can reduce speed dramatically, even stopping work entirely. Have you ever seen a system that was so complex that meaningful work could no longer be done in it? On the other hand, Simple things are not optimized for early speed, but because of their nature you do not end up with complexity. You will consider your implementation strategies more carefully. You will probably end up faster over time. The true value of software is in the quality of the artifacts that it produces. The artifact is what makes it to the user, not the construct. Complexity makes it harder to fix bugs and more difficult to reason about the system. If it works well, it'll be related to whether or not the output of those constructs was simple. [Did the constructs yield complexity?]" Hickey's talk goes through a lot of tools that lend themselves to complexity (e.g. state, inheritance, ORMs), or simplicity (e.g. functions), but the way we construct our presentation layer on the web isn't part of the discussion. 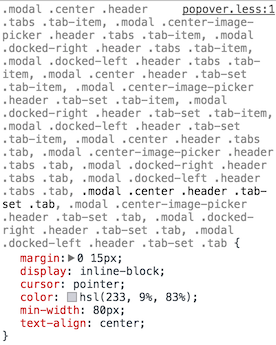 In light of that, it's interesting how directly-and-penetratingly the principles apply to CSS pre-processors. Nesting CSS styles via pre-processors is very convenient for developers. It's a wonderful developer construct but it introduces lots of unnecessary complexity to the CSS artifacts we're generating. Increased Filesize. More complex CSS means larger file size, so more time is spent sending stuff over the wire. CSS rules are evaluated right-to-left, and the styles aren't painted until after the browser is certain that the element matches the final left-most selector. To determine how much longer, consider the routine the browser must follow to render a CSS ruleset to the page: every element on the page must be checked to see if it matches h2, then .section.subcomponent, then .top-level-element. When you have a lot of elements on the page, that's a lot of checking. I hope it's obvious that the second image is a huge improvement: the surface area of the "selector" (which in the first case, is actually many, many selectors) is reduced and the code is smaller and faster. Keep the browser's CSS evaluation speed mentioned above in mind here too. Refactoring Difficulty: When CSS rulesets are smaller and better-factored, it's suddenly possible to discover and pluck out new abstractions, usually by extracting common stuff to a reusable class. The other benefit here is overriding styles. The flatter our styles are, the easier they are to override. Just because you don't need to override the styles now doesn't mean you won't need to do it a year from now. Refactoring Difficulty Part Two: This one isn't actually about difficulty, it's about possibility. If you do a really great job at keeping the CSS well-factored, you may discover that your 'structure' CSS is separate from the 'skin' CSS. Or at the very least, that you might be able to separate them. Dedication to keeping complexity low will pay off when you're (sooner or later) asked to give your large app a new look and feel. In this scenario, many of the structural patterns that your app depends on will have already been discovered and you will have written CSS for them. You're then free to focus on the look and feel instead of re-codifying the layout principles that your designers have bound the application to. Nicole Sullivan (@stubbornella) said "Never go more than three levels deep!" in reference to selector-nesting at JSConf almost three years ago (homage to Inception). Great coders like Jacob Thornton (@fat) and Harry (@csswizardry) think it's best to not nest CSS at all. Nicolas (@necolas) has been telling us for a few years that we need better structure. Adam Morse (@mrmrs_) has similarly been teaching us that simpler is better. Soon or later that app is going to get big, and some time after that, it will have to change. Simplicity is usually better for dealing with that change.